1. Gosteg Dafydd Athro/Gosteg of Master David, Robert ap Huw ms.
2. a. Y ddigan y droell/Erddigan of the spindle-whorl, Robert ap Huw ms.
3. Kaniad y gwynn bibydd/Caniad of the white piper, Robert ap Huw ms.
4. Kaniad San Silin/Caniad of St. Silin, Robert ap Huw ms.
6. Kaniad ystafell/Caniad of the chamber, Robert ap Huw ms.
b. Kaniad bach ar y gogower/Little caniad on the gogywair tuning, Robert ap Huw ms.
10. a. Kaingk Dafydd Broffwyd/Cainc of David the Prophet, Robert ap Huw ms. This programme contrasts two completely different repertoires of historical harp music from Wales. On one hand, we have a body of music in the Robert ap Huw manuscript (British Library Add. MS. 14905), written down in 1613, which is clearly medieval in character; on the other hand we have Edward Jones's antiquarian collections of music, printed less than 200 years later. One points towards fact, the other towards historical fiction, giving a new music without ritual function, serving as a curious entertainment. What lies between is a rapidly changing society, emerging out of a native Welsh culture, which originally had the security and the means to foster a tradition of elaborate formal literature and music, into a culture subsumed by bourgeois taste. It must be said that this new music is not a transformation of the older repertoire. Rather, it consists of English and Continental dance tunes which have been 'antiquised', that is to say, assigned to the remote past by way of their titles. The same sort of harp would have played both the medieval music and the new quasi-historical music of the 18th century. From the late 14th century to the 17th century, the 'Gothic' harp, with its distinctive buzzing bray pins, was heard all over Europe, and was particularly favoured in Wales. The Robert ap Huw manuscript clearly calls for the bray harp, to be played with fingernails, whilst damping rigourously with the finger pads. Indeed, a number of Welsh poems of the later Middle Ages accurately describe the brays (small crooked pegs which hold the strings into the soundbox, and lightly touch them, causing the strings to buzz) and praise their expressive power, as having the ability 'to speak every profound feeling'. In her article, 'Edward Jones's Musical and Poetical Relicks of the Welsh Bards, 1784: A Re-assessment', Joan Rimmer remarks, 'harps, of course, were not peculiar to Wales. The ascertainable history of that kind of instrument there reveals that a standard European renaissance harp with brays was in use in Wales in the 16th century and was regarded in the late 17th century as 'the proper Welsh harp'. Jones described the triple harp as 'the modern Welsh harp', without any reference to its non-Welsh origins, of which he was certainly unaware.' As new developments in harp construction arose, older designs continued in use, so that in Edward Jones's day, Welsh harpists could be found playing either the bray harp; the single-row staved-back harp without brays; the Welsh triple harp; or the new pedal harp. The performance of music in Edward Jones's collections would have presented a challenging struggle to the few remaining 18th-century bray harpists, who may have been pressed to play the latest tunes. The Robert ap Huw manuscript contains the earliest body of harp music from anywhere in Europe. Its date of 1613 could imply that the style of the music might be Jacobean, especially as its compiler was a harpist employed at the court of James I. But it is certainly not like any contemporary art music from late 16th century England or Western Europe. Instead, this strange and beautiful music is a fragment of a vast lost repertoire known to the medieval Welsh bards. Scarcely thirty tunes survive, yet they present many hours of performable music. The basis of this music rests not upon a contrapuntal framework, but acknowledges an ancient system of compositional formulæ, made up of contrasting chords notated in a binary fashion by '1's and '0's. Known as the 'twenty-four measures of string music' (cerdd dant), these patterns of tyniadau ('0's), providing tension, and cyweirdanau ('1's), giving resolution, were the musical equivalent of the 'twenty-four measures of Welsh poetry' (cerdd dafod), although we cannot assume a direct correlation. The manuscript is written in a unique harp tablature, indicating treble and bass, which strings should be played and the manner and fingers to do this. Fortunately, the manuscript provides a guide for the technique needed to play the music. Page 35 presents a thesaurus of musical figure, entitled 'gogwyddor i ddysgu y prikiad' [the principles for learning the pricking], describing different ways of striking a single string, ways of moving between adjacent strings and ways of playing various intervals. Modern pedal harp pedagogy concerns itself with a single ideal technique, asking the player to pluck the strings with the flesh of the finger pads. In contrast, Robert ap Huw gives a fingernail technique, which allows the player seven different ways of playing a single string. The page containing the 'principles' consists of three columns written by Robert ap Huw himself and an additional column of interpretation, written by the 18th century antiquarian Lewis Morris, along with his humble admission, 'these modern notes are only my guesses'. Robert ap Huw's guidance is in three columns. On the left are the names of the figures. In the middle are examples of the figures using the tablature system which is in the manuscript. The third column explains the figures using staff notation and triangular note heads, which are sometimes black and sometimes white. The direction of the stems and the black & white aspects of the heads all contribute to a unified technique, which exploits the subtle differences in weight between specific fingers, differences in the angle of the nails striking the strings and differences in the quality and duration of sustained buzzing allowed for each and every note. Several late medieval treatises explain that these figures are not merely ornaments, but serve as functional rhetorical devices, which articulate the contrasting chords found within the patterns of '1's and '0's. Tagiadau [chokings] stop between the '1's and '0's; plethiadau [plaitings] beautify '1's and '0's, introduce contention and begin a '1' or an '0'; crychiadau [wrinklings] complete or fulfill '1's and '0's; and cysylltiadau [connections] join '1's and '0's. Peter Crossley-Holland, who wrote the seminal article on the Robert ap Huw manuscript in 1942, has recently dated most of the pieces in the manuscript to the 14th and 15th centuries, and has also identified their composers. While Robert ap Huw himself owned a 30-string bray harp typical of the 16th century, a smaller and more delicate late medieval instrument would have been the original style of harp known to the composers. Both sizes of bray harps are used on this recording. A small harp without brays is also used to play one of the oldest pieces in the collection, 'Kaniad San Silin'. Prof. Crossley-Holland mentions in his article that 'Silin, though it may have been used wrongly for the names of certain Celtic saints, more probably refers to St. Giles.' As a song praising a medieval saint, the piece in its original form, perhaps different from that written down in the manuscript, could likely be from the 13th or 14th century. It is a clear sign of antiquity that 'Kaniad San Silin' requires only 13 strings. Iconographic evidence suggests that brays do not appear on harps until the late 14th century, and justifies my choice to use the small 'Cithara Anglica' for this piece, being a characteristic pan-European medieval harp. A wyr viwsig ar fysedd. Ah, see! our last, best harper goes. Sweet as his strain be his repose! Perhaps Edward Jones's translation is an indication of what could have happened to the music itself as he presented it to the bourgeois audience of his day, though I would emphasise that, apart from 'Cainc Dafydd Broffwyd', the pieces in Edward Jones's collections are not translations of medieval music into 18th century idiom. What were those late 18th century bray harpists playing? In its waning years, the bray harp was used not for playing subtle compositions based on a system of archaic formality, as seen in the pieces within the Robert ap Huw manuscript, but for playing dance tunes at public entertainments. Audiences had long ago stopped listening to the bray harp's ability to 'speak every profound feeling', but delighted in its punchy growl, which kept it in fashion as a popular dance instrument. For this programme, I have extracted the essence of Edward Jones's arrangements, to explore how some of the older tunes in his collection might have sounded on the bray harp, which for several hundred years was the 'proper Welsh harp', and continued to be used, especially in South Wales, into the 19th century. A gosteg is a piece which calls for silence, demanding the complete attention of its listeners. This is the first piece of music in the Robert ap Huw manuscript, and is composed according to the measure korffiniwr, given as 1100 1011 1100 1011. There are ten sections or ceinciau [branches], with the same refrain or diwedd [ending] concluding each one. 'Probably this is the same ancient Air, as that of Erddigan y Droell', so wrote Edward Jones in his notes to the tune. Erddigan is a classic Welsh musical form. Clearly, Edward Jones's tune is not the same as that found in the Robert ap Huw manuscript. Both tunes may simply be stylised work songs. 'Y ddigan y droell' is one of the few pieces in the Robert ap Huw manuscript to have rhythmic markings. In this case, they establish a regular, even beat that may relate to the spinner's movements. While Edward Jones translates droell as 'spinning wheel', it referred in the Middle Ages to a spindle-whorl: the weight attached to the lower part of a drop-spindle, acting as a flywheel to maintain the spinning momemtum. Interestingly, Plato, in The Republic, describes the Music of the Spheres using a model of the Spindle of Necessity. In his vision, the Spindle's luminous axis pierces the rotating Cosmic Whorl, on the edges of which sat the Fates, the daughters of Necessity, and singing Sirens. A composition consisting of thirteen ceinciau, including an internal repeat. Each section, or cainc, uses the measure tityr bach: 0011 0011. Caniad popularly means 'song', but is best left untranslated. It is one of the forms of musical composition, which student and professional harpers of the Middle Ages were expected to know, alonside others, such as gosteg or profiad. A note at the end of this caniad tells us that it is to be played in either tro tant or isgower tuning; I have chosen tro tant. The same diwedd concludes each of the twelve ceinciau. Throughout the manuscript, Robert ap Huw often presents the music in shorthand. In this piece, as in others, instructions to the player allow a complete performance to be realised. The ystafell [chamber] mentioned in the title refers to the private apartment of the family, away from the hall. It was here that the bardd teulu [poet lauriat of the household] performed for the queen as well as performing for the soldiers in the hall. Edward Jones remarks, 'this is a Key peculiar to the Ancient Welsh Music; which is call'd Gogywair: The E, or third above the Key-note being flat.' Jones's account of the ancient tuning of gogywair, with its flattened third, is verified by the 1605 manuscript of John Jones, Gellilyfdy. Gwilym Puw's manuscript of 1676 also names gogywair as 'the siarpe sette'. With its twelve ceinciau, the 'little caniad' is quite a substantial composition. The diwedd contains a melismatic phrase similar to the diwedd in 'Kaniad San Silin'. Edward Jones's note reads: 'A Sacred Theme. The above Subject, was taken from a curious musical Manuscript of the 11th century; and probably the Tune is of a much more ancient date.' Edward Jones's source is obviously the Robert ap Huw manuscript, and it is telling to note the difference between the two interpretations of the same melody. I have chosen to play the original 'Kaingk Dafydd Broffwyd' in the tuning of bragod gywair, with Bb and Eb in each octave, which places the piece in the dorian mode. Bragod gywair, described by Gwilym Puw as 'the ordinarie sette', is a logical starting point for exploring pieces in the manuscript, for which there are no tuning indications. Edward Jones proceeds from the assumption that the piece is in the key of 'C' major, as it seems to appear at first glance in the tablature. Bartélémon, a respected violinist in Edward Jones's London circle of musicians, made a transcription of the tune from the manuscript. The variations which follow are decidedly typical of the 18th century, intended to exploit the range and colours of the Welsh triple harp. My own arrangement of this piece on the bray harp is made easier by the lack of chromatics in Jones's edition, but I have been obliged to substitute other solutions idiosyncratic to bray harp technique for the echo variation (number five) and some of the rapid passages. Yn siarad pob teimlad dwys. Curved/bent appropriate brays / speaking every profound feeling. J. Rimmer, 'Edward Jones's Musical and Poetical Relicks of the Welsh Bards, 1784: A Re-assessment'. Canu Gwerin [Folk Song], v. 10, 1987, p. 38. P. Crossley-Holland, 'Secular Medieval Music in Wales'. Music and Letters, vol. XXIII, no. 2, April, 1942, p. 11. E. Jones, Musical and Poetical Relicks of the Welsh Bards. 1784. London, title page. J. Rimmer, op cit, p. 30. E. Jones, Hên Ganiádau Cymru. 1820, p. 45. T. Price, The literary remains of the Rev. Thomas Price... 1855. Landovery: William Rees, p. 21. E. Jones, The Bardic Museum. 1802. London, p. 89. E. Jones, Hên Ganiádau Cymru. 1820, p. 1. E. Jones, The Bardic Museum. 1802. London, p. 95. E. Jones, Musical and Poetical Relicks of the Welsh Bards. 1784, p. 134. E. Jones, The Bardic Museum, p. 106. I. Williams, 'Cerrorion a Cherddau yn Lleweni, Nadolig 1595', Bulletin of Celtic Studies, vol. VIII, part 1, November, 1935, p. 8. E. Jones, The Bardic Museum, p. 70. 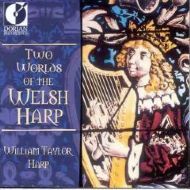 William Taylor is a specialist in the performance of ancient harp music from Ireland, Scotland and Wales, and is one of the very few players investigating these repertoires on medieval gut-strung harps, wire-strung clarsachs and Renaissance harps with buzzing bray pins. He hasn't always been a harpist; he trained as an art librarian and served as an art librarian at the University of Rochester, New York and at the National Gallery of Art in Washington, DC. It was in Washington that he began his career in early music, playing with ensembles including the Folger Consort, Hesperus and the Newberry Consort. As a teacher of historical harps, he is frequently invited to lead workshops in the UK, Europe and the USA. He is a teacher-in-residence for Ardival Harps in the Scottish Highlands. He has taught and performed at music festivals in Cardiff, Edinburgh, Inverness, Warwick and York; Termonfeckin, Ireland; Burgh Heimbach, Mosenberg and Schloss Burg, Germany; Venice; and Amherst, USA. He writes a regular column for the magazine Sounding Strings on playing wire-strung clarsachs, and often contributes to other harp-related journals. He is currently president of the International Historical Harp Society. William Taylor performs as a soloist and as a member of several groups. He plays with lutar Rob MacKillop in The Rowallan Consort, and has recorded two CDs of mediæval and Renaissance Scottish music with him. He is also a member of the Highland early vocal and instrumental ensembles Musick Fyne and Coronach. He has recently established a duo with Belgian recorder player Geert van Gele, performing 15th, 16th and 17th century music. Several radio and television broadcasts have featured his work with ancient Irish, Scottish and Welsh harp traditions, including live BBC Radio 3 broadcasts with the Taverner Consort. He has worked closely with the Glasgow-based choir Cappella Nova, accompanying the singing of music associated with St Kentigern and by Hildegard of Bingen. During the 1998 Edinburgh International Festival, he performed in three concerts within the series 'Scottish Harps'. Mr. Taylor can also be heard on the CD Graysteil: Music from the Middle Ages and Renaissance in Scotland, Dorian DIS-80141.